Amid preparations for a NASA spacewalk Thursday to isolate a space station solar array coolant leak, the Russians launched an unmanned Progress supply ship, monitored its automated docking six hours later and then fired the thrusters of another cargo craft to move the lab complex out of the path of a threatening piece of space debris. The debris, from an Iridium communications satellite that was destroyed in a 2009 collision with a Russian satellite, was tracked throughout the day, but NASA flight controllers could not rule out the possibility it might pass close enough to the space station to pose a threat. Playing it safe, the flight control team in Houston decided Wednesday evening to order a debris avoidance maneuver, and Russian flight controllers agreed to adjust the station's orbit by firing the thrusters of an older Progress supply ship docked at the station's Earth-facing Pirs module. The firing began on time at 7:08 p.m. EDT (GMT-04), and while the burn duration and the resulting orbit were not immediately known, NASA reported flight controllers "expect the maneuver to provide adequate clearance to avoid the debris." What turned into an extremely busy day for the space station team began with the successful launch of the Progress M-17M spacecraft from the Baikonur Cosmodrome in Kazakhstan at 3:41:18 a.m. EDT (1:41 p.m. local time). Loaded with 2.9 tons of supplies and equipment, the supply ship was released into its planned preliminary orbit eight minutes and 45 seconds after launch. A few moments after that, the spacecraft's two solar arrays and navigation antennas deployed as planned. "Good morning ," station commander Sunita Williams radioed NASA flight controllers in Houston. "Happy Halloween, and hopefully our little trick-or-treat vehicle is on its way. We just got to see it out the window and that's pretty special. Hope you guys are having a great day." Six hours -- four orbits -- after launch, the Progress spacecraft reached the International Space Station and moved in for a docking at the aft port of the Zvezda command module at 9:33 a.m. as the two spacecraft sailed 250 miles above Bogota, Columbia. 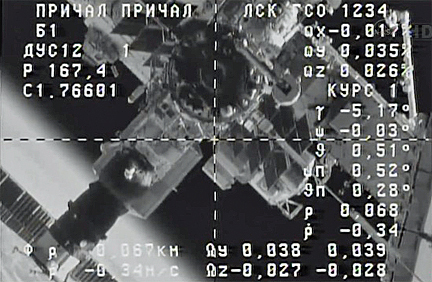 "Congratulations on a successful automatic docking," a Russian flight controller radioed. "Thank you, Moscow. Congratulations to you as well," cosmonaut Yuri Malenchenko replied. 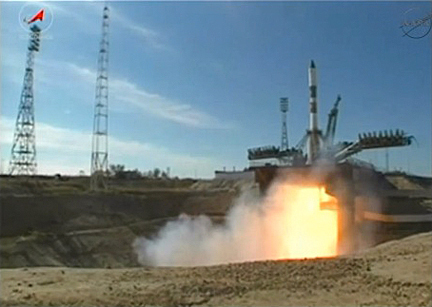 This was the fourth Progress launched this year, the second to follow an abbreviated four-orbit rendezvous with the space station. Russian flight controllers normally implement two-day rendezvous profiles, but they are perfecting procedures for single-day flights for possible use with manned Soyuz missions to shorten the time crews are forced to spend in the cramped ferry craft. The Progress M-17M spacecraft is loaded with 2,050 pounds of space station propellant, 62 pounds of oxygen, 42 pounds of air, 926 pounds of water and 2,738 pounds of spare parts, crew supplies and equipment. It is scheduled to remain docked at the space station until next April. With the Progress firmly locked in place, Williams and Japanese astronaut Akihiko Hoshide turned their attention to preparations for a planned six-and-a-half-hour spacewalk Thursday to troubleshoot an ammonia coolant leak in one of the station's four solar array modules. Williams and Hoshide plan to deploy a spare radiator and reconfigure coolant lines to isolate a suspect radiator that may have been hit by a piece of space debris. But the leak is so small, it will take several weeks for flight controllers to find out whether the isolated radiator is, in fact, the source of the problem. If not, a second spacewalk may be required to replace a pump module or other equipment. The spacewalk was scheduled to begin around 8:15 a.m. Thursday.